Robust and distinctive native Campanula commonly found in vineyards, mixed hedgerows and various types of woodland, with triangular leaves and a long, one-sided inflorescence. 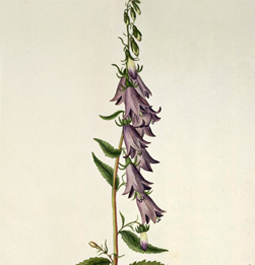 The genus name derives from the Latin “campanula”, meaning small bell, while the specific epithet means “small turnip”). Although not commonly used, its young spring leaves are edible.